Discussion in 'iPad Accessories for iPAD 1, 2 and 3' started by ipadfanatic, Jul 14, 2010. Does anyone know of any Bluetooth Speakers that would work with the iPad. I like to listen to Streaming Internet Radio or Podcast while in the shower but I don't like to have my iPad in the bathroom (moisture from the steam). I saw a few on ebay and Amazon (cheapo's) but not sure if they would work or not.... Experiences? I don't have one of these, but it looks pretty neat! It looks like the iPad won't dock directly to the base unit, but apparently you can hook up any audio source using a standard stereo audio cable. Oh, you did one better as its waterproof. I added it to my wishlist on Amazon. Thanks. 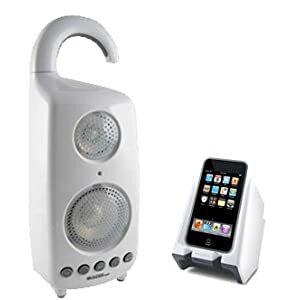 I have [ame="http://www.amazon.com/Sony-SRS-BTM30-Bluetooth-Wireless-Speaker/dp/B000OQHCTM/ref=sr_1_1?ie=UTF8&s=electronics&qid=1279247006&sr=8-1"]Sony's SRS-BTM30 Bluetooth speakers[/ame]. I use them with my iPad and my iPhone without issue. They work well without any dropouts like I have experienced with some Bluetooth headsets that I have tried. They also work on battery or wall power. My only complaint is once you get out of range of the speakers you have to reconnect to them by going to Settings>General>Bluetooth. It's not a big deal, just a little inconvenient. As far as the cheap speakers you have seen on Amazon, theoretically, any Bluetooth speakers should work. It says it will work with what looks to be just about any MP3 player so it must have some sort of audio input jack... somewhere... and so it would probably work with an iPad with an appropriate cable.... maybe. Not sure about streaming int radio but using it Bestbuy rocketfish stero bluetooth headsets which work great with ipad and ipod. The OP said he wanted Bluetooth speakers for his bathroom so he could listen while in the shower. I don't think the speakers have to be in the shower with him though . Correct, they don't have to be in the shower, just in the bathroom. I saw that insignia has a bluetooth speaker and thought about purchasing it off ebay. I have a two pair of Insignia bluetooth headphones and the range on those things is excellent (it's atleast 100 feet with walls as I can be downstairs in my dining room and the iPad is in my bedroom with the door closed).